France has one of the best railway systems in the world. The network is accessible, affordable, and quick. It puts to shame many of its European neighbors, to say nothing of the mess on the other side of the English Channel. It also happens to be nationalized, and employees benefit from a special employment status that provides enhanced job security and early retirement. The arrangement has long angered business elites and right-wing governments — which, naturally, means it has become a subject of “reform” efforts by current President Emmanuel Macron. Fresh from overhauling labor law in favor of employers and slashing taxes on the ultrarich, the former investment banker who dreams of transforming France into a “start-up” nation is on to his next move. But the government’s chief target is the railroad worker “statut,” the special employment status that applies to 140,000 employees of the SNCF. Under this system, employees cannot be laid off for economic reasons and they have the ability to retire earlier than most of the French workforce. 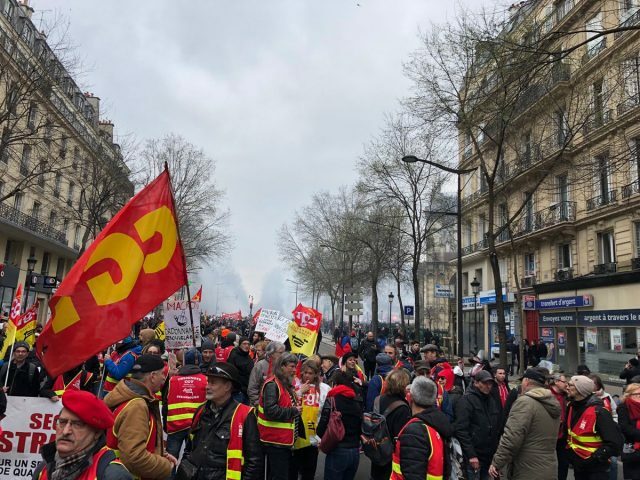 While the general retirement age is 62, SNCF conductors can retire at age 52, and other railroad personnel at 57.As most trade unionists and left-wingers readily acknowledge, the special employment status by itself is a tricky thing to defend. By definition, it applies only to railroad workers, just as journalists, doctors, and civil servants have statuts of their own. At a time when many young and working-class people are mired in precariousness and unemployment, sympathy for rail workers and their employment advantages isn’t exactly widespread. In fact, a recent poll showed nearly 7 in 10 favor eliminating the statut. The president and the cabinet understand what this means. Successful passage of the reforms depends on isolating rail workers from the general public — on painting them as privileged vestiges of a bygone era who need to wake up to the realities of the modern, globalized economy. Cole Stangler is a Paris-based journalist writing about labor and politics. A former staff writer at International Business Times and In These Times, Cole has also published work in VICE, The Nation, and The Village Voice.